Chaim Feuerman holds the Golda Koschitzky Chair in Jewish Education at Yeshiva University’s Azrieli Graduate School of Jewish Education and Administration. Rabbi Dr. Feuerman has headed day schools and has served as professional developer/consultant to Jewish day schools and Jewish communal agencies. 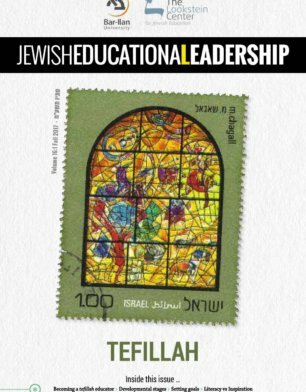 Chaim Feuerman describes an approach for empowering middle school students and making their tefillah respectable. Despite the encouragement of the usual extrinsic motivators for participation and consequences for lack thereof, Seattle Hebrew Academy eighth graders declined some years ago to be active participants in Shabbat morning synagogue congregational worship. Their dedicated and enterprising Judaic studies teacher, Rabbi Menachem Goldberg, inquired of them why. They said that the rabbi’s sermon was too long and that the special occasion announcements were too time-consuming to be of real interest to them. Rabbi Goldberg asked whether, if he were to arrange for a synagogue congregational worship service that was exclusively theirs, would they participate? They said yes. Rabbi Goldberg arranged it on his own time, with no remuneration from the school or the synagogue, and the middle schoolers kept their word. The middle school Shabbat morning worship service, “owned and operated” by the middle schoolers themselves, ages 11, 12 and 13, turned out to be an enthusiastically well-attended success, eventually attracting adult would-be participants as well. Rabbi Goldberg had discovered the key; namely, turn the ownership of the prayer service over to the students themselves, allowing them to make all decisions regarding the appointed times for each of the prayer segments, who leads which parts of the worship service, who is honored with being called to the Torah, who reads which of the Torah portions aloud, etc. Observing this successful little prayer-leading enterprise called to mind the middle school prayer services which I used to facilitate in collaboration with the Judaic studies faculty at the Yeshiva of Central Queens and at the Jewish Foundation School of Staten Island back in the 1970s and at the Westchester Day School back in the 1980s. Our goal was to have the prayers take place in a quiet, orderly, reflective setting – one which many educators would consider to be desirable in and of itself, although some educators consider this kind of prayer service somewhat sterile, rigid and frigid. However, we left the more lofty and noble goals of inspiring students to fervent intent during prayers to occur on their own. We limited ourselves to the more modest goals of no-talking and no-misbehaving during prayers in the hope that more desirable behaviors would emerge on their own. Prayers begin at 7:29 am, not a second before, nor a second after. The pre-appointed leader of the prayers stands before the lectern, enwrapped in prayer shawl and phylacteries, awaiting the signal to begin the first barukh of the early morning blessings. From that instant on there is no talking by the student gabbaim (who had been in training during the last weeks of the previous school year). Any gabbai who talks is immediately removed from his post. There are two subsets of teachers –- those who say the prayers along with the students and those who have already prayed at an early worship service before having arrived at school. Those who have already prayed may speak in order to maintain appropriate decorum. Those who are praying along with the students may not speak at all other than to say their prayers. All communication is done by gabbaim and teachers via non-verbal cues; for example, if the gabbai wishes to honor a student with leading a segment of the prayers he offers the student a neatly folded prayer shawl. If the gabbai wants to know the Hebrew name and father’s Hebrew name of one who is being called to the Torah, the gabbai begins ya’amod… looking in the direction of the one being called and waits for him to say his Hebrew name and his father’s Hebrew name aloud. Students who are neglecting to say the prayers are encouraged to do so by the teacher’s saying the words of the prayers aloud. The strings of “tzitzit” are glanced at by the teachers, each of whom is assigned to one specific grade – 6, 7 or 8. This is done at the time when the Shma is recited –- students display them wordlessly at the appropriate time. The result of f the above is a no-talking, no-nonsense, no-misbehaving reflective environment which is conducive to proper prayer although it does not guarantee it. 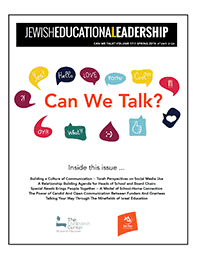 Some educators might understandably think that a factor in whatever successes the program engendered was the fact that the parents of these middle schoolers were “shul goers” and so their children wanted to feel like adults by doing what their parents were in the habit of doing; namely, by conducting themselves at prayer in a manner similar to that of their parents. In actual fact, however, the parents’ shul-going was a detriment to the orderliness and decorum of their children’s in-school prayers. Non-stop talking and chaos regretfully often characterized the synagogue worship in which the parents participated. As a result, the middle schoolers sometimes needed a few days of “recuperation” from the congregational worship services which they had been attending when school was not in session for the holidays. A glaring weakness in the program is its male-oriented ownership. The middle school girls enjoyed only a passive role in the ownership of the prayers at that time. Yet the girls seemed content with their role, perhaps because it was the culture of the times. Some modification might very well be called for in the spiritual climate of 2017. The approach embodied in the manner of leading prayers which we describe in detail here may seem outdated to some educators – after all, we are recalling interventions that were implemented over thirty years ago. In fact, however, those interventions were ahead of their time. Student empowerment was a relatively new concept in the 70s and 80s while today every student is empowered from the time he/she gets his/her first iPad or smart phone. It is our belief that the sense of ownership which was engendered back then works as effectively in the same way today as it did yesteryear.